We love email as much as the next person, but there’s just something special about getting a handwritten letter from a friend. Call us sentimental, but letters will never get old, no matter how high tech our world becomes. In honor of this sacred, treasured form of human connection, we’re digging out our ball points and sharpening our pencils to write you a handwritten note to say “Hi, there! How ya doin’? Thanks for signing up for our email list.” And to say THANK YOU a little louder than usual, we’re also including some special gifts in each letter we send. In addition to your handwritten letter from a real live human, you might receive a special offer or swag from one of our local businesses. Who’s to say? OK –we’re to say, but we don’t want to give it all away. 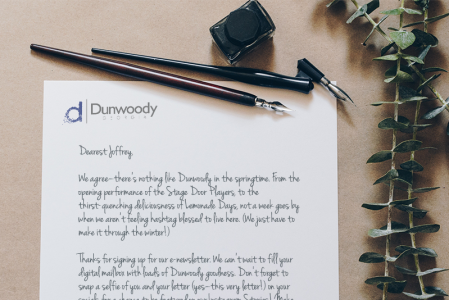 To get your very own handwritten letter from Dunwoody, please complete the form on this page and opt-in to the terms (hey, we’re an above-board organization here). Bots not welcome!